Galaxy Gazebos There are 8 products. The New Trend in Galaxy Gazebos really is setting the trend in modern gazebo design. The design is simple but feels highly contemporary and amazing quality great for both commercial and domestic buyers … The mainframes and roof shutters are made from toughened aluminium with a silver-grey powder coating that looks great and adds to the contemporary feel. Great for both commercial and domestic buyers … The main frames and roof shutters are made from toughened aluminium with a silver-grey powder coating that looks great and adds to the contemporary feel. 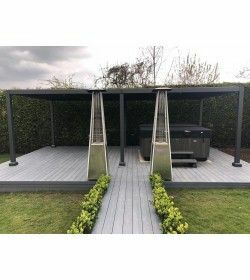 Shuttered Roof: This is the key feature of the gazebo’s design, mechanisms that facilitate this are robust and built to last so they won’t fail over time. This is the side screens only. NO GAZEBO IN THIS PURCHASE Set of Four Side Screens for the Galaxy Gazebo Side Screens 3 X 3.6M. This is the side screens only. 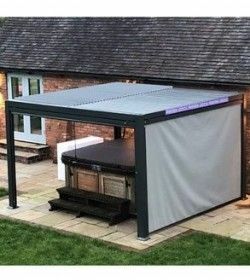 NO GAZEBO IN THIS PURCHASE Set of Four Side Screens for the Galaxy Gazebo 3.5 x 5.4M Only. This is the side screens only. NO GAZEBO IN THIS PURCHASE Set of Four Side Screens for the Galaxy Gazebo 3.5 x 7.2M Only.